" “I am alone and miserable. Only someone as ugly as I am could love me.”"
Throughout cinematic history, the monster of Frankenstein has manifested itself in every type of genre from horror to comedy to animation. This idea of the reanimation of a human continues to capture the hearts of modern audiences, even though the story has its origins in the 18th-century. The author of this iconic character in literary history continues to represent groundbreaking aspects for women and her story carries a specific mythical element. 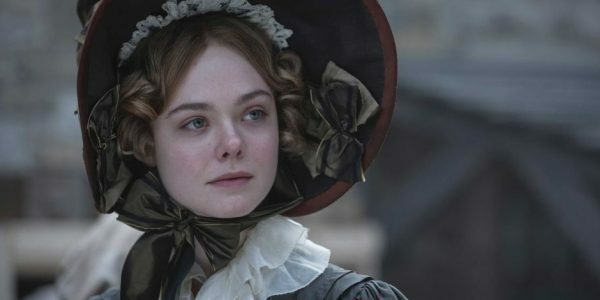 It may not have been the intent of Mary Shelley (Elle Fanning) to become a symbol for female authors, but her story should be as fascinating as her fictional characters. The biopic opens on the life of Mary Wollstonecraft Godwin, who was the daughter of the late proto-feminist writer Mary Wollstonecraft and political philosopher William Godwin (Stephen Dillane). A dreamer who spends much of her time writing and drawing at the gravesite of her mother who died while giving birth to the young writer. To escape the toxic atmosphere of the Godwin’s home, she chooses to elope at 16 years of age with the womanizing romantic poet Percy Bysshe Shelley (Douglas Booth). As she rushes into the arms of her handsome, but unreliable husband she takes her half-sister Claire Clairmont (Bel Powley) who relishes in the bohemian lifestyle of the young couple. On a stormy summer evening in Geneva as the guests of Lord Byron (Tom Sturridge), each guest is given the challenge of writing a ghost story to share with the others on holiday. Relying on her previous writings and using the tumultuous relationship with her husband, she writes her gothic masterpiece for this challenge. Penned in an era of male-dominated publishing and as her husband desired to take credit for her work, she must fight to establish her independence as a writer and as a pioneer in literature. Mary Shelley’s is a fascinating story and should be an inspiration for women around the world, because of her long-lasting influence on literature, science-fiction, cinema, and feminism. Which makes it surprising that Saudi Arabian director Haifaa al-Mansour (Wadjda) would choose to wrap this legendary tale up in a brooding, teen romance that fails to capitalize on the inspirational elements to Shelley’s biography. The director is making history herself by being the first female Saudi to make a film based on an English literary legend. Despite the historical nature of the content and the production, the film struggles to capture the significance of the history being portrayed. A perfect example of female empowerment or at a minimum depicting how the literary masterwork was inspired by the misery Mary experienced at the hands of the men in her life, this script fails to bring these elements to bare. The poorly executed dialogue fails to take advantage of the eccentric nature of the Shelley’s relationship by making things mundane and being left to extended monologues that are difficult to believe occurred in real life. Even in the hands of established stars like Fanning, Booth, Powley and the over-the-top performance of Tom Sturridge as Lord Byron, this cannot lift this production off the examination table. Mary Shelley should have been a celebration of one of the most influential women in literature, but her story seems to have been run through a Jane Austen reworking. For the woman who is credited with establishing the horror genre and even attributed to science fiction, it is unfortunate this biographical sketch seems to be lifeless.